As a website owner, you would like to give unique and impressive look to the website by using a lot of graphics, beautiful logos, banners and Flash-based content. 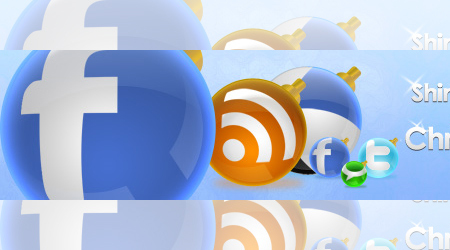 One of the best ways to enhance the look of the site is to use social media icons. These Christmas icons are used to display the images of social networking sites such as Twitter, Facebook, Digg, Myspace, Technorati, StumbleUpon and various others. These icons can be downloaded from the internet and they are available for free. Christmas is coming, if you’re looking for doing something new on your website on Christmas this year; you will be glad to know that there are a lot of options to choose from for social media icons for Christmas. This is the best way to bring new tastes to your readers. 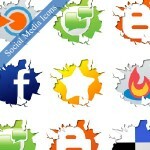 Today in this post, I just would like to show you a list of social icon sets for Christmas because now it’s time for social/bookmark sites, for sharing everything on our profiles. It seems that we hear/read about them every day, so now it shall be not too much if you read one more time about social network sites. This set can be used on Christmas for greeting people who visit the site. Web owners having the theme of the site as Christmas can choose from some amazing social media icons from this set. These icons can be used few days back on the sites to let people know how much excited you are about Christmas this year. A wide range of Christmas icons are available to choose from. Depending upon your choice and preferences, you can choose the best one. I think this is one of the most beautiful icons set for Christmas. These types of icons give a Christmas-like impression when used on the blogs. This is one of the free icon sets consisting of 30 social network icons available on the Internet which can be used on the sites on Christmas. The set contains glossy icons to be used on blogs and look too amazing. This is quite amazing and one of the cutest iconsets available this Christmas. Choose one of them to make the site more impressive. This Christmas social icons set is the excellent one for people who are looking for social icons made by circular shapes. They are most amazing and very beautiful icons to be used on various websites and blogs. You have options to choose the color and from 36 icons. Get them on your sites and appeal visitors with their shine and beauty. For people who want to use something stylish and very creative, can make use of these icons on their sites on Christmas. These are the icons that can be used on various sites to give the feel of Christmas holidays. These are the best icons which you can use on your blogs on Christmas. You can choose from amazing feed icons and impress the visitors. 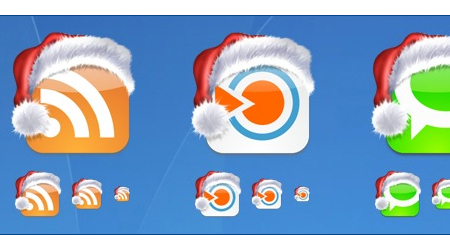 This set has 1 RSS icon for Christmas, but it’s so amazing & beautiful! That’s all social icons sets I think they’re best for this Christmas, maybe you’ll think that there are still many awesome social icons sets, don’t hesitate to recommend them in your comments. yea nice Work. Hey, I just hopped over to your site via StumbleUpon. Not somthing I would usually browse, but I appreciated your views none the less. Thanks for creating something worthy of reading. .
Woah! I’m really digging the template/theme of this site. It’s simple, yet effective. A lot of times it’s difficult to get that “perfect balance” between superb usability and appearance. I must say you have done a great job with this. Also, the blog loads super fast for me on Firefox. Outstanding Blog! It is surprising that you have created such nice icons for Christmas. I just hope that I have seen this long before Christmas. 🙂 Cheers Mate! It would be a great for website owner to have this icon in their site, it will remind people that Christmas season and it is time for joy, love and sharing.